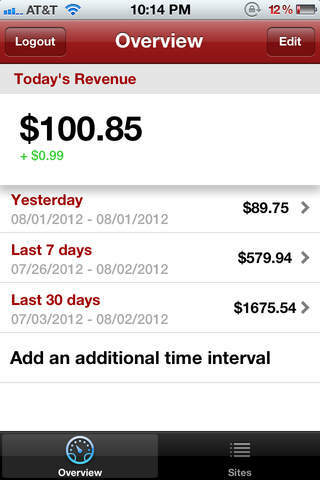 Earnings for Admob is the only functional Admob client on the App Store. "Earnings" makes it easy for you to quickly check your earnings for the day with a dashboard that'll have you never going back to the website. - View detailed information like eCPM, requests, fill rate, clicks and more! - View any time interval. (As far as 6 months back). If you need any help, feel free to email me for support.